We manufacture Beaded Necklace at very competitive prices. These necklaces are made from Horn. We also manufacture bone, wood & resin necklaces. Please email us for our catalog. Aimed at a prosperous growth in this domain, we are instrumental in offering an excellent quality range of Green Stone Necklace. 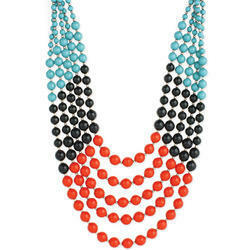 We have gained a huge pleasure in the industry by offering a wide range of Blue Beaded Necklace. It is made up of wood and fully made by hand. We makes these beaded necklace to use high quality materials in different colours and patterns. Beaded Necklace Developed and designed in tandem with the industry defined norms and parameters, offered products are delivered and provided to our customers with durable finish. Dimensionally precise, these offered products are obtainable at market leading prices. We offer an excellent range of designer beaded necklaces that are made of excellent stones, ones that are classiest and one of a kind. Made with excellent quality beads and stones this necklace is guaranteed to help you stand out of the crowd. Hand made resin beat necklace. Beads Jewellery Set With Nackleace, Earrings & Braclet.We offer a Wide range of Imitation Jewellery in brass, Stone, Resin, Beads & Wood.